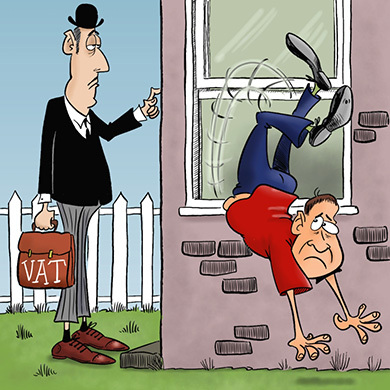 There really is no need to be scared of the VAT man. Whether you're using the Standard Rate Scheme or the Fixed Rate Scheme (we can work out which is best for you), we'll take control and submit your return on time. All you need to do is pay him. If your turnover exceeds the current registration threshold of £85,000 in a rolling 12 month period, then you need to register for VAT. We can help you with this. If you're already VAT registered, check out one of our cloud options - 'Taking your First Steps', 'Finding your Feet' or 'Up and Running' - and don't forget to tick the VAT registered box when getting a quote. Your fee will be £30.00 for each return submitted (included in your monthly payments for one of our cloud options). Fill in our "Enquire" form and we'll get in touch with you. Don't forget to let us know if you've been kindly referred to us by a friend. If you decide to go ahead, we'll send you a proposal email with a link to sign our Letter of Engagement. Don't worry, it's a rolling contract and doesn't tie you in! Once signed, you'll be prompted to register on our portal and fill in some basic details. Once done, we'll discuss anything we need from you and set you up with access to a Dropbox account to upload files.